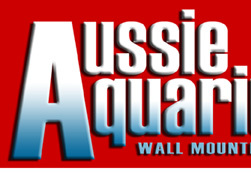 Cutting edge design and high quality materials are what Aussie Aquariums were founded upon. Created in Australia, these wall mounted aquariums are a chic and hip addition to any home or office decor. 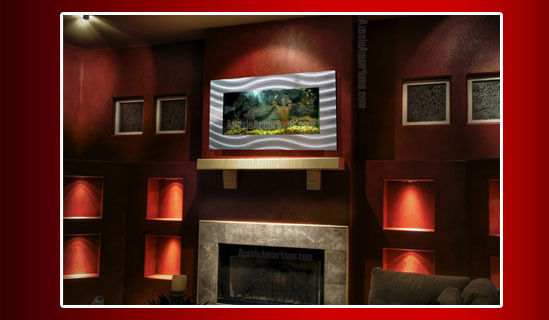 They present the image and dimensions of a hanging plasma style television but contain an inner world of aquatic life. They are an amazing conversation piece and a great space-saving addition to any room. 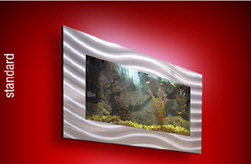 Our one-of-a-kind wall mounted aquariums are sure to please the senses. We take the beauty of an everyday aquarium and turn it into a work of art....literally! It's a hanging fish tank with beautiful design and color. You can decorate your new aquarium with any ornaments, gravel, sea rocks or shells that you like. Customize them to fit your surroundings. At only 4.5" deep and with up to 21 gallons of water, Aussie Aquariums create a spectacular world for a variety of marine life. 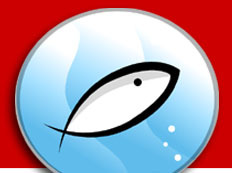 All the basics of your dream aquarium are included. We include an innovative multi-function submersible water filter, custom fit lighting fixture, pre-cut custom lid, a variety of colorful marine backgrounds, mounting brackets with hardware and all the basics including a fish net, siphon cleaner and grabber tongs. Select one of the styles at left to see exact dimensions and volume. There are dozens of installation photos on this site to give you a better idea of how it will look in your home or office. If you have any questions feel free to contact customer service or call us.